We have a change of venue for this year’s effort. Click on the poster for programme of park’s events this month. Please come along, either to help or as a visitor. The society will provide some short talks indoors, and if the weather is OK, there will be a good selection of telescopes to view the night sky. Bright objects only, it’s not a properly dark sky. We have telescopes available if you don’t have your own. MEMBERS: If you can help in any way – and you really DON’T need a lot of expert knowledge – please let me know. 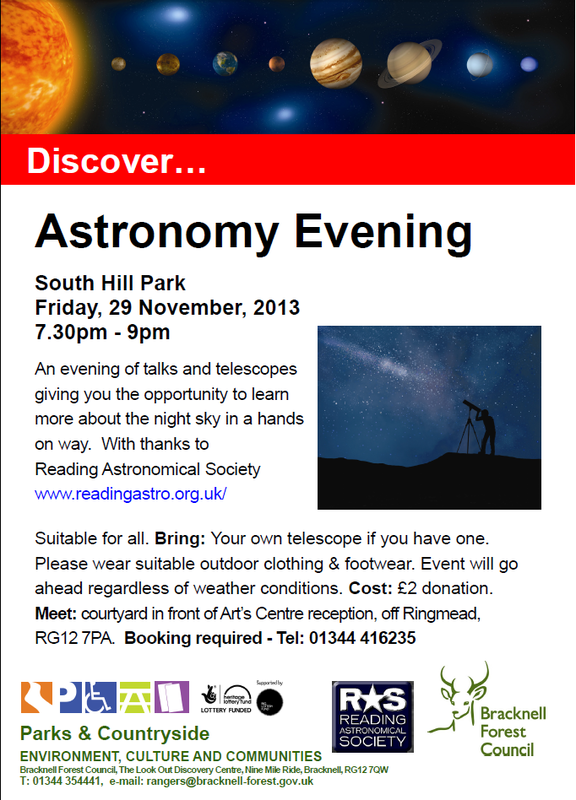 We’ll need telescopes and helpers, plus a few who would like to give a 10-15 minute talk on anything astronomical. I’ve got a talk on meteors; if you have one on Comet ISON, or constellations, imaging, whatever, it would be very welcome. This should attract a lot of younger people, so nothing too technical. This entry was posted by gbond on October 26, 2013 at 20:19, and is filed under Events, News. Follow any responses to this post through RSS 2.0.You can leave a response or trackback from your own site.